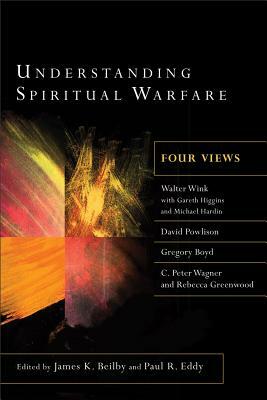 Microview: “Understanding Spiritual Warfare: Four Views” edited by James Beilby and Paul Rhodes Eddy | J.W. Wartick -"Always Have a Reason"
Understanding Spiritual Warfare: Four Views is one of the most diverse presentations of views on a topic in a book of this sort I have read. I went into reading this pretty much blind to what positions existed, so take this as perspective from someone with some theological training, but no specific background in this area. The work starts with an introduction that does a great job introducing questions of primary importance in discussions of spiritual warfare. Walter Wink’s (alongside Gareth Higgins and Michael Hardin) view is presented first and might best be summarized as: Satan is equal to (and reducible to) human institutions of evil and suffering; he is neither personal nor is he the enemy of God but rather God’s servant–showing people their evil. We fight Satan by fighting institutionalized evil. David Powlison’s “Classical” view is that spiritual warfare is essentially living like Christ and fighting temptation and sin. Satan is a real person and tempts us. Evils are combated through prayer and a call to repentance. Gregory Boyd’s “Ground-Level Deliverance model” argues for both a Christlike life but also for active warfare against demonic powers and Satan (who are personal and ontologically extant) on an individual level. C. Peter Wagner and Rebecca Greenwood’s “Strategic Level Deliverance model” is committed to finding and rooting out demonic activity in local and even national levels, including making “spiritual maps” to find where areas of demonic activity might be found and trying to identify the specific demons behind various activity. From the above, it may seem like these views are radically diverse. You’d be correct to think so. James Beilby and Paul Rhodes Eddy did a fantastic job putting together this volume with such diverse views. Questions of orthodoxy at times arise (particularly in regard to Wink’s perspective), but this makes it clear how much divergence there is related to this specific issue. The responses to the different views are each insightful and provide more material of interest to pursue. It’s rare that I’ve had a book be this interesting and engaging throughout. I highly recommend this volume for anyone with even a remote interest in the topic of spiritual warfare. James Beilby and Paul Rhodes Eddy, eds., Understanding Spiritual Warfare: Four Views (Grand Rapids, MI: Baker, 2012). Oh, man! I thought you were going to give us the lowdown on your view. It would be interesting to see how someone with your training and education would understand or interpret spiritual warfare. Well I honestly know little enough about the topic so I would definitely not claim to have any training or education in this area, but from this book I’d say my view most closely aligns with Greg Boyd’s (which surprises me because I disagree with Boyd on several other topics). Specifically, I think that there are real spiritual forces with which we must do battle, but that these instances are fairly limited and that a dose of skepticism is not necessarily unwarranted. However, I think it is highly problematic to simply dismiss reports of possession and the like as impossible as well. I don’t see warrant biblically for thinking they won’t continue to occur. But yes, this is all from someone who hasn’t thought terribly much on the topic. I am definitely willing to admit I don’t know much about it.